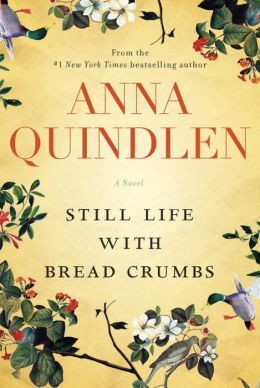 Anne Quindlen’s Still Life With Bread Crumbs is a fast read with a slow impact that lingers. Her heroine is a sixty year old photographer with a stalled career who finds a new lease on life and love in a romantic comedy with a happy ending. After renting a broken-down country house two hours away from the exclusive Manhattan apartment that she can no longer afford, Rebecca Winter inadvertently discovers new inspiration for her work in a dog, a roofer, and a series of roadside memorials mysteriously scattered throughout the woods around her cabin. As Rebecca progresses through her self-actualization, the story includes romance and satisfaction in her new life and those around her – and the promise that life always has surprises no matter how old you are – some good, some not. I always look forward to Quindlen’s witty tales, and this one did not disappoint. This entry was posted in authors, book review, books, reading and tagged Anna Quindlen, Jim Bates, Manhattan, Photographer, photography, Quindlen, Rebecca, Rebecca Winter, romance at sixty, Still Life With Bread Crumbs. Bookmark the permalink. Already looking forward to her next one.